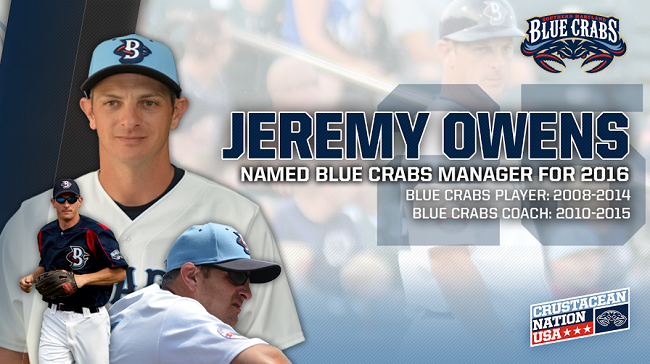 Jeremy Owens has been a Southern Maryland Blue Crab since the first season of the franchise in 2008. Owens, who played for the Blue Crabs from 2008-2014, has worked diligently as a player and a coach to help the on-field product of the Blue Crabs grow, occasionally taking the reins of the ball club. Now, the Blue Crabs are his. Owens was named to manage the 2016 Blue Crabs as the hand-picked successor to Stan Cliburn, it was announced today. Cliburn will move north to manage the New Britain Bees who will be playing their first season in the Atlantic League of Professional Baseball. Entering his 16th professional season, Owens set franchise highs in games played (728), home runs (104), extra-base hits (253), runs scored (421), stolen bases (98), and walks (318). Owens is on the top 10 list of all-time team leaders in every major offensive category. In 2009, former manager Butch Hobson named Owens team captain to the unanimous approval of the Blue Crabs clubhouse. Owens went on to set single-season franchise records during the 2009-10 season appearing in 137 of 140 games played and belting 28 home runs. His 28 home runs also led the Atlantic League. Owens was selected by the San Diego Padres in the eighth round of the 1998 June MLB Amateur draft and has spent parts of his sixteen year career with the Padres, Boston Red Sox, and Tampa Bay Rays minor league systems, reaching Triple-A for all three organizations. In 2005 Owens made his Atlantic League debut with the Somerset Patriots. "Southern Maryland has been very special to me for the past eight seasons," Owens said. "I have spent half of my baseball career with this franchise, and I am extremely humbled that I have been chosen to lead the Blue Crabs in this capacity. I have a lot to be thankful for this holiday season." About the Southern Maryland Blue Crabs The Blue Crabs play 140 regular season games in the Atlantic League, considered the highest level of Minor League Baseball. Atlantic League players are “Major League-ready” and over the last 17 years, more than 650 players have advanced from Atlantic League clubs to Major League organizations, making the Atlantic League a preferred route for experienced players to be scouted by Major League Baseball. The Blue Crabs play at Regency Furniture Stadium in Waldorf, Maryland. Please call 301-638-9788 or visit www.SOMDbluecrabs.com for more information and to reserve your seat at the ballpark today!